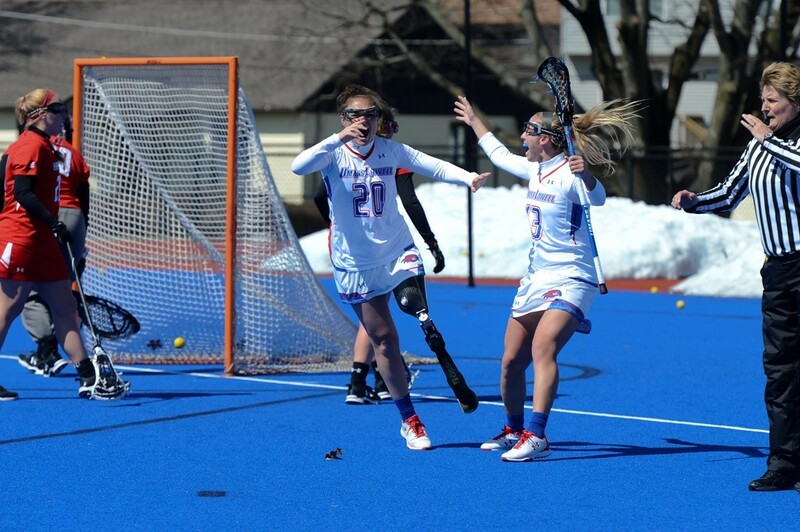 In 2016, redshirt sophomore attack Noelle Lambert of the women’s lacrosse team was in a moped accident in which she lost her left leg. Starting all 17 games her freshman year, Lambert was an integral part of the team, but she was unable to play last season. On Saturday, April 7, she returned to the field in her first match since the accident. Surprising the team and fans alike, she scored a goal in the River Hawks’ victory. Lambert has been training for the past year and half to make her way back onto the field. In the game against the University of Hartford, Lambert was subbed in and made an immediate impact scoring her first goal of the season. With the lacrosse community rallying around her, Lambert made incredible progress over the last year. After completing a rigorous training schedule over the summer with a trainer who lived near her house, Lambert returned to school in the fall and began participating in workouts with the rest of team. While no one on the team expected her to succeed as fast as she did, Lambert continued to defy expectations. In addition to the usual team exercises, for the past two months Lambert has been putting in extra hours outside of practice with the assistant coaches to gain more confidence in her footwork and stickwork, but also to make sure she had the right mindset if she were to enter a game. Medeiros echoed Lambert’s statements saying that she wanted to see Lambert putting in the work just like anyone else on the team. Medeiros wanted to see the results of her training in practice and see her accomplish certain tasks before she considered putting her into a game. Medeiros thought that Saturday’s game might be an ideal one for her to play in because, if all went to plan, nothing too large would be on the line, and Lambert could play with less pressure on her shoulders. Scoring a goal, however, was not anticipated by anyone. Lambert was not expecting to play on Saturday, but when the opportunity presented itself, Medeiros knew she and the team would be comfortable putting her in. While there were some concerns about letting her play too soon, Medeiros and Lambert communicated openly about where Lambert was at mentally, as that was just as important as being physically prepared. Having spent last season as a supportive teammate from the bench, Lambert had no problem continuing that role this season, but she also wanted to put in the work to make significant physical progress to ensure that was not her only role. However, emotional support was something the team had lacked in years past, so Medeiros was glad to see Lambert stepped up to fill that spot when she was still unable to take the field. And while Lambert was there to support her teammates in any way she could, they were right there with her working in the gym and on the field. Lambert said the bonding that occurred among the whole team was crucial to their success on the field. Now that her first game back is behind her, Lambert will continue to train each day and put in the work until she knows she can consistently play and know that she has the full support of her coach and teammates. She said next year she is aiming to have a bigger role on the team but understands that could be on the bench or on the field. Medeiros reiterated the need for Lambert to keep practicing and to get stronger every day but is fully expecting her to make a large impact as a player on the field. Medeiros fully believes that Lambert has the drive and determination to come back even stronger in the next year. With the encouragement of her teammates and coaching staff, Lambert understands this is not something she has to go through alone.